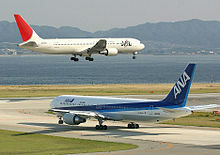 資料來源：Boeing 767 specifications, Boeing 767 airport report, Airliners.net 767 pages. ^ 1.0 1.1 Boeing: Commercial Airplanes The Boeing 767 Family. [2012-02-25]. ^ 2.0 2.1 2.2 2.3 767 Model Orders and Deliveries summary. Boeing. May 2012 [June 17, 2011]. ^ 3.0 3.1 3.2 3.3 Boeing Commercial Airplanes Jet Prices. Boeing. [December 14, 2010]. ^ 8.00 8.01 8.02 8.03 8.04 8.05 8.06 8.07 8.08 8.09 8.10 8.11 8.12 Velupillai, David. 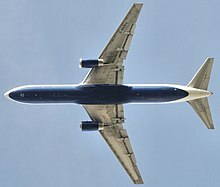 Boeing 767: The new fuel saver. Flight International: 436–37, 439, 440–41, 445–48, 453. August 8, 1981 [July 30, 2011]. ^ 25.0 25.1 767 Airplane Characteristics for Airport Planning (PDF). Boeing: 4–5, 9–14, 23, 28, 32, 35, 37. June 2010 [July 29, 2011]. ^ 27.0 27.1 History of the 767 Two-Crew Flight Deck. Boeing. [July 29, 2011]. ^ 31.0 31.1 Velupillai, David. Boeing 757: introducing the big-fan narrowbody. Flight International. January 2, 1983 [February 2, 2011]. ^ 36.0 36.1 Sweetman, Bill. Boeing tests the twins. Flight International. March 20, 1982 [July 15, 2011]. ^ 40.0 40.1 Lynn, Norman. Boeing 767 moves smoothly into service. Flight International. April 2, 1983 [January 20, 2011]. ^ 42.0 42.1 42.2 42.3 42.4 42.5 42.6 42.7 Boeing 767 Program Background. Boeing. [July 30, 2011]. ^ 767-300ER Technical Characteristics. Boeing. 2011 [July 31, 2011]. ^ McKinzie, Gordon. How United Airlines Helped Design The World's Most Remarkable Airliner. American Institute of Aeronautics and Astronautics. [July 1, 2011]. （原始內容存檔於2009年6月1日）. ^ Norris, Guy. Boeing acts to solve 757/767 pylon cracks. Flight International. May 24, 1995 [December 26, 2011]. ^ Military Aircraft Directory: Boeing. Flight International. July 29, 1998 [December 9, 2011]. ^ Guy, Norris. Boeing poised to fly first 767 AWACS. Flight International. November 16, 1994 [August 30, 2011]. ^ Lopez, Ramon. Continental goes Boeing. Flight International. June 18, 1997 [December 28, 2011]. ^ Sonic Cruiser seeks mission definition. Interavia Business & Technology. July 2001 [December 29, 2011]. （原始內容存檔於2012年7月12日）. ^ Norris, Guy. Pumped for action. Flight International. November 7, 2006 [August 30, 2011]. ^ Shalal-Esa, Andrea. Pentagon nears new contract in air tanker saga. Reuters. February 24, 2010 [December 26, 2011]. ^ McCarthy, John; Price, Wayne. (March 9, 2010). "Northrop pulls out of tanker bidding war." Florida Today, p. A1. ^ Wallace, James. Stalled 767 deal may cost jobs. Seattle Post-Intelligencer. February 20, 2004 [December 26, 2011]. ^ Hoyle, Craig. Japan receives last Boeing KC-767 tanker. Flight International. January 14, 2010 [August 18, 2011]. ^ 73.0 73.1 Boeing 787 Dreamliner Aircraft Profile. Flight International. 2011 [July 30, 2011]. ^ Ionides, Nicholes. JAL to take 11 767s and 777s in 787-delay compensation deal. Flight International. September 17, 2008 [September 15, 2011]. ^ Ageing jets to fly on due to delay in Boeing Dreamliner. Herald Sun. September 9, 2011 [January 19, 2011]. ^ Goold, Ian. Checking Up on the 767. MRO Management. June 2010 [December 26, 2011]. （原始內容存檔於2012年4月26日）. ^ Walker, Karen. Finally ... the 787 enters service. Air Transport World. October 27, 2011 [December 9, 2011]. ^ UPS order revives 767 line. Seattle Post-Intelligencer. February 5, 2007 [August 19, 2011]. ^ Cassidy, Padraic. DHL orders 6 Boeing 767 freighters. MarketWatch. March 8, 2007 [August 19, 2011]. ^ Thomas, Geoffrey. Boeing considering new 767 freighter to counter A330-200F. Aviation Week & Space Technology. March 2, 2007 [July 29, 2011]. ^ 81.0 81.1 Boeing Company Annual Orders Summary. Boeing. [January 23, 2011]. ^ Ranson, Lori. Blended winglets debut on Boeing 767. Flight International. July 22, 2008 [August 19, 2011]. ^ Yeo, Ghim-Lay. Farnborough: Hainan and ANA to equip Boeing aircraft with winglets. Flight Daily News. July 23, 2010 [August 19, 2011]. ^ Delta takes tips from Aviation Partners. Flight Daily News. June 20, 2007 [August 19, 2011]. ^ Ostrower, Jon. 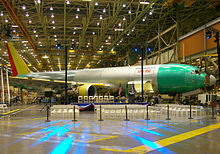 Boeing unveils 1,000th 767. Air Transport Intelligence. February 3, 2011 [February 6, 2011]. ^ Thousandth 767 etches twinjet's place in history. Flight International. December 1, 2010 [January 20, 2011]. ^ 87.0 87.1 Dunlop, Michelle. 767 now built faster and in less space. The Weekly Herald. March 6, 2011 [July 30, 2011]. ^ Boeing presents KC-767 proposal to USAF. United Press International. January 3, 2008 [December 26, 2011]. ^ Reed, Ted. Boeing 767 Removed From Life Support. The Street. December 20, 2011 [December 26, 2011]. ^ Young, David (June 17, 1982). "767's maiden O'Hare landing is automatic". Chicago Tribune, p. 3. ^ FAA Order 8900.1 Flight Standards Information Management System (FSIMS), Volume 4 Aircraft Equipment and Operational Authorizations. Federal Aviation Administration. September 13, 2007 [July 29, 2011]. RVR 300, Runway Visual Range 300 meters. ^ Pace, Eric. How Airline Cabins are being Reshaped. The New York Times. May 24, 1981 [February 1, 2011]. ^ Davis, Elizabeth. Boeing Signature Interior a hit with flying public. Frontiers. April 2003 [August 19, 2011]. 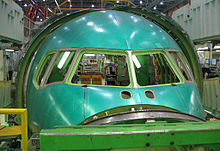 ^ Thomsonfly.com Launches Enhanced Interior Package for Boeing 757-200 and 767-200. Boeing. March 9, 2005 [August 19, 2011]. ^ Our Planes. American Airlines. 2011 [August 28, 2011]. ^ ICAO Document 8643. International Civil Aviation Organization. [2016-02-17]. ^ 107.0 107.1 107.2 World Airliner Census (PDF). Flight International: 15. August 2011 [September 13, 2011]. ^ Norris, Guy. Boeing enters UPS bidding with 767 'Special Freighter'. Flight International. April 22, 1998 [December 28, 2011]. ^ Supplemental Type-Certificate Data Sheet (PDF). European Aviation Safety Agency: 4. February 23, 2011 [August 18, 2011]. ^ Federal Aviation Administration Type Certificate Data Sheet A1NM (PDF). Federal Aviation Administration: 6–8. March 4, 2011 [December 26, 2011]. ^ 767-200ER Technical Characteristics. Boeing. 2011 [July 31, 2011]. ^ Delta Museum – Boeing B-767. Delta Air Lines Air Transport Heritage Museum. [August 18, 2011]. ^ Boeing Recent Orders. Boeing. May 2012 [June 17, 2011]. ^ Boeing Company Current Deliveries. Boeing. May 2012 [June 17, 2011]. ^ Orders and Deliveries search page. Boeing. May 2012 [June 17, 2011]. ^ USAF Reviewing Training After MAX 8 Crashes; KC-46 Uses Similar MCAS. www.airforcemag.com. [2019-03-23] （美國英語）. Becher, Thomas. Boeing 757 and 767. Marlborough, Wiltshire: Crowood Press. 1999. ISBN 1-86126-197-7. Birtles, Philip. 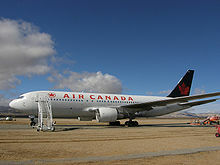 Modern Civil Aircraft: 6, Boeing 757/767/777. Third Edition. London: Ian Allen Publishing. 1999. ISBN 0-7110-2665-3. Davies, R.E.G. TWA : an airline and its aircraft. McLean, Virginia: Paladwr Press. 2000. ISBN 1-888962-16-X. Donald, David (編). The Complete Encyclopedia of World Aircraft. New York, New York: Barnes & Noble Books. 1997. ISBN 0-7607-0592-5. Eden, Paul (編). Civil Aircraft Today: The World's Most Successful Commercial Aircraft. Silverdale, Washington: Amber Books Ltd. 2008. ISBN 1-84509-324-0. Frawley, Gerard. The International Directory of Civil Aircraft. Weston Creek, Australian Capital Territory: Aerospace Publications. 2001. ISBN 1-875671-52-8. Haenggi, Michael. 767 Transatlantic Titan. "Boeing Widebodies" series. Osceola, Wisconsin: Motorbooks International. 2003. ISBN 0-7603-0842-X. Kane, Robert M. Air Transportation 1903–2003. Fourteenth Edition. Dubuque, Iowa: Kendall Hunt Publishing. 2003. ISBN 978-0-7872-8881-5. Norris, Guy; Wagner, Mark. Boeing Jetliners. Osceola, Wisconsin: MBI Publishing. 1996. ISBN 0-7603-0034-8. Norris, Guy; Wagner, Mark. Boeing. Osceola, Wisconsin: MBI Publishing. 1998. ISBN 0-7603-0497-1. Norris, Guy; Wagner, Mark. 767: Stretching and Growing. Modern Boeing Jetliners. Osceola, Wisconsin: Zenith Imprint. 1999. ISBN 0-7603-0717-2. Norris, Guy; Wagner, Mark. Boeing 777, The Technological Marvel. Osceola, Wisconsin: Zenith Press. 2001. ISBN 0-7603-0890-X. Norris, Guy; Wagner, Mark. Boeing 787 Dreamliner. Osceola, Wisconsin: Zenith Press. 2009. ISBN 978-0-7603-2815-6. Shaw, Robbie. Boeing 757 & 767, Medium Twins. Reading, Pennsylvania: Osprey Publishing. 1999. ISBN 1-85532-903-4. Smil, Vaclav. Transforming the Twentieth Century: Technical Innovations and Their Consequences. Oxford, Oxfordshire: Oxford University Press. 1998. ISBN 0-19-516875-5. Sutter, Joe. 747: Creating the World's First Jumbo Jet and Other Adventures from a Life in Aviation. Washington, D.C.: Smithsonian Books. 2006. ISBN 0-06-088241-7. Taylor, John W.R. (編). Jane's All the World's Aircraft 1989–90. London: Jane's Yearbooks. 1989. ISBN 0-7106-0896-9. Wells, Alexander T.; Rodrigues, Clarence C. Commercial Aviation Safety. New York, New York: McGraw-Hill Professional. 2004. ISBN 0-07-141742-7. Wilson, Stewart. Ansett: The Story of the Rise and Fall of Ansett, 1936–2002. Weston Creek, Australian Capital Territory: Aerospace Publications. 2002. ISBN 978-1-875671-57-1.